New eGuide offers insights on how workplace volunteerism and social impact activities increase employee engagement, productivity, and commitment -- all of which have direct positive impacts on the bottom line. Having an engaged workforce is a crucial competitive advantage in today’s marketplace, not only for motivational, feel-good reasons, but for bottom-line returns. Today, Network for Good (http://www.networkforgood.org/partner) releases a new eGuide, “Employee Engagement: 5 Trends Shaping Employee Social Impact Programs,” that provides strategies and tools to promote employee involvement in social good and volunteer projects. It also shows how increased engagement through impact programs adds to the company’s bottom line. You can access the eGuide here. 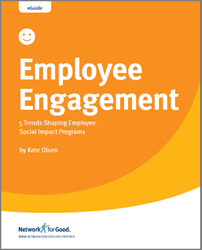 The new eGuide outlines the case for cause and explains how social impact increases engagement by empowering employees to support their favorite causes while at work. It describes five trends that are shaping social impact in the workplace; charity rewards, mobile access to an engagement portfolio, sharing through social media, micro “do-gooding” and global participation. It also provides tactical recommendations for implementing the trends. For more information on how to enhance your own social impact program, visit Network for Good at networkforgood.org/partner. Network for Good is a social enterprise that empowers corporate partners and nonprofits to unleash generosity and advance good causes. Network for Good works with companies to help refine a cause strategy perfectly suited to business and philanthropic goals and implement effective cause initiatives powered by our proven donation platform. We also help nonprofits raise funds for their missions through simple, affordable and effective online fundraising services and offer free training through our online learning center, interactive online community, and Nonprofit911 webinar series. Network for Good has processed more than $800 million in donations for more than 80,000 nonprofits since our 2001 founding by AOL, Cisco and Yahoo!.